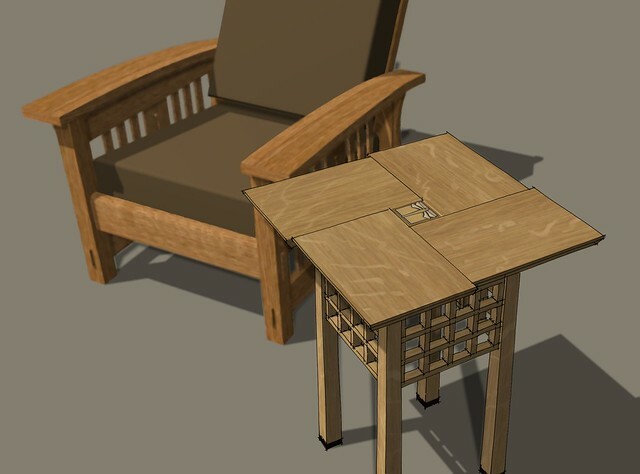 Google's Sketchup is a free application that allows you to model all sorts of things in 3D, easily and quickly. Here is a video by Dave Richards of Fine Woodworking, showing how he goes about drawing a piece of furniture. I'll be sure to post up what I come up with and perhaps you can critique my work. Thanks again for sharing this with the community! Great resource! The important thing to keep in mind, as stated in the video from Dave Richards, make everything a component. That way you're only drawing like pieces once. Any holes you have to make, taper you have to cut, etc is automagically repeated on all the like pieces. Just pay attention to how he flips things along the axis when moving things around. I've been learning SketchUp as I learn woodworking. It is a terrific tool. Yesterday I made a few size adjustments as I finish the body of this DVD cabinet, tweaking the two tops a quarter inch or so to account for the "planned size" vs. "actual size" of the finished piece. Very worthy of a "Nailed it!" How long did that take you to create? And are you planning on making the real thing anytime soon, I'd love to see how it turns out. I found that adding the shadows really gives it a nice effect too! Oh, and one thing I found that I was doing too was making a ton of guide lines and it looks like you did just the same too = ) You can hide them using View -> Hide Guides, just in case they bugged you when looking at the final product, like they did for me. Unless you need the guidelines, you'll probably find it easier to create them and then delete them as you go. Just use Edit / Delete Guides. As I mentioned before, the best thing to do, make everything a component. Create the rough shape, then triple click on it, right click and select Make Component. Give it a nice descriptive name too. As an example, here is a coffee table a friend asked for help designing. Relatively simple. MDF top (2'x4') with a routed edge. The feet are just 1x6 and the skirt is a 1x3. 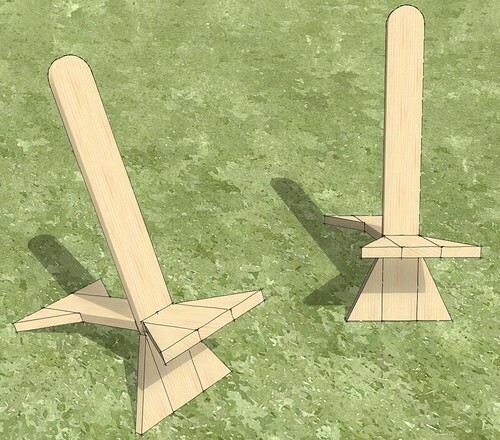 Each of the legs is made up of four pieces of 1x6, cut square. The dowel hole on the top and the screw holes to attach them all together are in the same place on all the pieces. By drawing one of the pieces and making it a component, I only have to copy the piece around where I need it. If I have to make an adjustment, I only have to do it once and it's then replicated to all the copies. To make those adjustments easier, I just make a temporary copy to work on. In the example above, The outside two pieces of each leg are identical, so there are eight pieces I only had to draw once. The inner two pieces are slightly different, so I copied one of my outer pieces, selected it, right click on it, Make Unique, add my new screw holes and copy it in place. So there are five variations of the main component that makes up the leg. I drew the long skirt piece once and made a copy for the other side, likewise for the short skirt. Dave's video is a great learning tool to watch to figure out an efficient workflow. BTW, the cushion is from the 3D Warehouse. My friend intends to make their own cushion. It will be used as a floor cushion to sit on when not on the coffee table for storage. EDIT: one advantage of using Sketchup to visualize and plan out a project, I just noticed I forgot two of the dowel holes in the top. I'll have to go back in and add those before I hand this over to them. Paul, thank you for the reference to my video. I hope some readers have found it helpful. There's another video showing a similar process using Thomas Jefferson's bookstand as the model. Your comment about deleting guidelines is a good one. Once you're finished with the guidelines, delete them so they don't clutter the drawing space. I do this frequently enough that I've assigned a keyboard shortcut to Edit>Delete Guides. In case anyone is interested here are a few recent doodles. 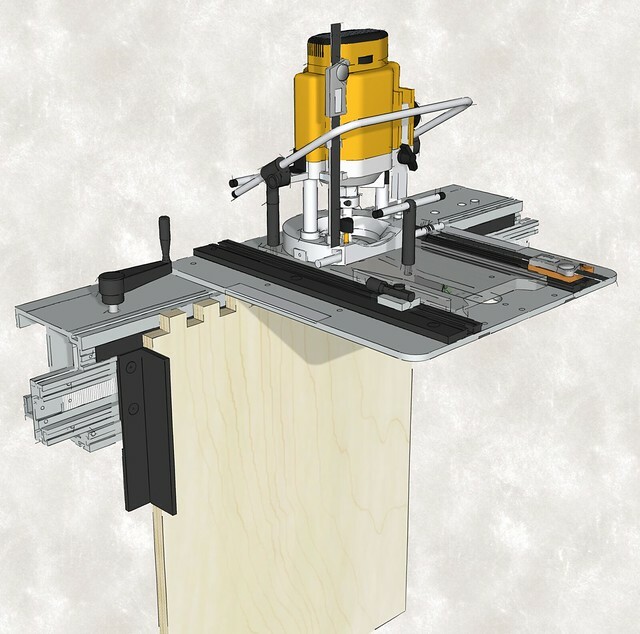 Now to those of you who don't know, Dave is the Sketchup guru for woodworking. He helps run a blog on Fine Woodworking's site called Design. Click. Build. Now anytime you want to delete guidelines, just press Alt+G. Thank you. And thanks for alerting me to the bad link. I've repaired it now. p.s. I had a little fun with the 2x6 chair. It's a good drawing exercise for learning SketchUp and building an efficient workflow in drawing. Here's the follow-up on my post from six months ago. My DVD/VCR/modem/cable box cabinet is done. The bottom door will conceal the surge supressor, and all the internal shelves have holes to allow power cords and cables to move through. Well done! Quite the display of talent. Deserves a nailed it.